There is no looking away because there have been no compromises. Spacious enough to hold a precise attention to detail. A particular vision of innovation is boldly illuminated. As nimble as it is commanding, it puts the control in performance. Year after year, the aspiration of utter perfection is pushed even further. Leadership is defined and redefined. There is no expectation left unfulfilled. Impossible to ignore, unmatched interior prestige and extraordinary comforts are concluded with a bold, distinguished exterior. There is no comparison. HIGHLIGHTS 2019 ESCALADE Designed to exceed every expectation of what an SUV is and can do. A meticulously crafted vehicle with an unmatched exterior style, interior comforts and power, the 2019 Cadillac Escalade SUV represents the perfect balance of sophistication, functionality and technology. This is unequalled ambition on a grand scale. PERFORMANCE THE POWER AND THE BRAINS As intelligent as it is powerful. The 2019 ESCALADE luxury SUV combines dynamic performance and poised handling with a surprising fuel economy. The 6.2L 420-hp V8 engine is paired with an intelligent 10-speed automatic transmission that moves between gears smoothly. And engine technologies like Continuous Variable Valve Timing, multi-port Direct Injection and Active Fuel Management1 ensure that 621 Nm of torque are used efficiently. 10-SPEED AUTOMATIC The 10-speed automatic transmission delivers near-instantaneous shifts for smooth acceleration and optimal power in any gear. INTELLIGENT PERFORMANCE The 420-hp 6.2L V8 engine offers technologies such as Continuous Variable Valve Timing, Direct Injection and Active Fuel Management1 to ensure power is harnessed efficiently. READS THE ROAD 1,000 TIMES PER SECOND Balance and control. Magnetic Ride Control reads the road up to 1,000 times per second and automatically adjusts to road surfaces. 4-WHEEL DRIVE Get power where you need it most. Effortlessly shift between 2WD, 4WD HI, 4WD LOW and AUTO to manage the road ahead. STABILITRAK® Enhanced control. StabiliTrak selectively applies braking pressure to any one of the vehicle wheel brakes to assist the driver in keeping the vehicle on the intended path. READY FOR THE LONG HAUL Pull your own weight, and then some. The standard Trailering Package 2provides a staggering 3674 kg trailering capacity. TECHNOLOGY FORM MEETS FUNCTION Intelligently designed, brilliantly capable. 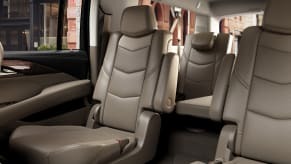 Amenities fill the 2019 Escalade. From flexible interior space to advanced technology enhancements, the 2019 ESCALADE luxury SUV is designed not just to meet your expectations, but also to satisfy more. TAKE THE GUESSWORK OUT OF PARKING Automatic Parking Assist automatically steers your vehicle, moving at idle speed, into a detected parallel or perpendicular parking spot, while the driver brakes and selects the appropriate gear. AN INNOVATIVE LOOK BACK The available Rear Camera Mirror streams rear-facing video that provides a wider, less obstructed field of view than a traditional rear view mirror. A MORE CONNECTED DRIVE Cadillac user experience3 with phone integration offers Apple CarPlay™4 compatibility. Access Siri, Apple® Music, contacts and more from your iPhone® with a touch of the vehicle screen. REMOTE START Allows you to remote-start your Cadillac by using the key fob. INTERIOR MAKE IT YOURS WHAT YOU NEED , EXACTLY WHERE YOU WANT IT. Envelop yourself in sophistication and innovation. 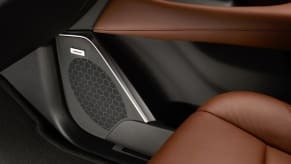 The 2019 ESCALADE luxury SUV’s interior is crafted with care and attention to details reminiscent of fine tailoring. With cut-and-sewn stitching, hand-finished design touches and materials like semi-aniline leather, it provides utmost comfort for all passengers. 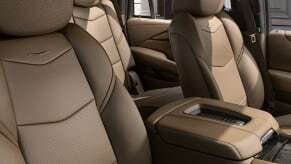 Indulgent comforts like available massaging front seats make every ride even more enjoyable. 3,424L of cargo space in Escalade ESV. EXTERIORS LEGENDARY LOOKS . REFINED DETAILS . An imposing presence. With dramatic angles and powerful planes, the 2019 ESCALADE provides more than impressive scale. Thoughtful design details like chrome accents and an impressive lighting system complement it's look. One that is unmatched by any other vehicle on the road, and yet, is unmistakably Cadillac. CRYSTAL-CLEAR VISION Striking full LED headlamps frame the bold signature grille. Featuring five stacked crystals with available LED Cornering Lamps that project light into corners as you turn. CUTTING-EDGE ILLUMINATION Full LED Light Blade taillamps emit thin blades of light that give the Escalade an unmistakable signature at night. 22-INCH POLISHED ALLOY WHEELS Make a statement. The 22-inch polished aluminum wheels are cast-formed to minimize weight while gaining strength and second looks. POWER ASSIST STEPS Open one of the doors and the available Power Assist Steps lower to greet you. HANDS-FREE LIFTGATE The Hands-Free Lift-gate opens and closes with a simple kicking gesture, even when your hands are full. INVISIBLE REAR WIPER The rear wiper conceals itself to stay protected from the elements, while preserving the iconic rear design. CONCIERGE LIGHTING Available Concierge Lighting includes LEDs in the door handles, power assist steps and interior, providing clear illumination upon exit and approach. SAFETY EVERYTHING TO KEEP YOU SAFE Countless innovations for your peace of mind. 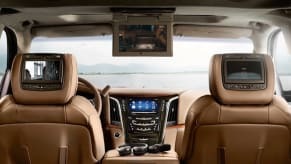 With an ultra-high-strength steel alloy safety cage and a sophisticated collection of radar, camera and ultrasonic sensors to detect potential hazards, the 2019 Escalade luxury SUV is engineered to help you feel safe at all times. 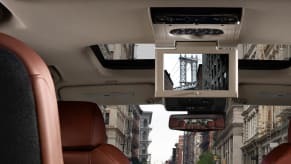 SURROUND VISION Surround Vision provides a bird’s-eye view of the area immediately surrounding the vehicle when in low-speed Drive or Reverse. This view, projected onto the Cadillac user experience screen, helps increase your awareness when parking. LANE KEEP ASSIST WITH LANE DEPARTURE WARNING Available Lane Keep Assist with Lane Departure Warning helps you stay in your driving lane. FORWARD COLLISION ALERT Available Forward Collision Alert monitors traffic ahead and warns you of potential hazards. LANE CHANGE ALERT WITH SIDE BLIND ZONE ALERT Available Lane Change Alert with Side Blind Zone Alert warns you of vehicles that are in your side blind zone. FORWARD AND REVERSE AUTOMATIC BRAKING Forward and Reverse Automatic Braking can automatically engage your brakes when it senses a potential front-end or rear-end collision and the driver has not already applied the brakes. Estimated 15.1 L/100 km city 4x2. Fuel consumption estimates based on GM preliminary testing. 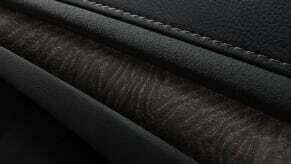 Your actual fuel consumption may vary. The system wireless charges one PMA- or Qi -compatible mobile device. Requires compatible smartphone and data plan rates apply. 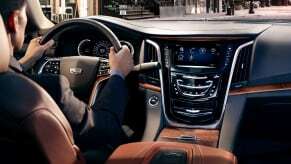 To check for phone or other device compatibility, see my.cadillac.com.